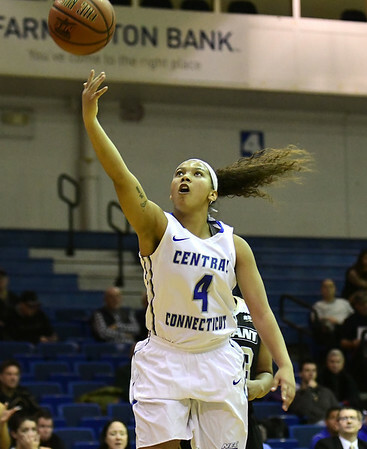 STATEN ISLAND, N.Y. - The CCSU women’s basketball team was facing a big road game against Wagner with its four-game winning streak on the line. The Blue Devils turned in a big performance and erased a 16-point deficit to beat the Seahawks 66-64. Kiana Patterson led CCSU with her first double-double of the season. She finished the game with 24 points and added a career-high 12 assists. From the floor the Blue Devils shot 25-of-55 in the game. Wagner’s Sierra Clark had a game-high 28 points and chipped in 10 rebounds to go with it. CCSU will travel to take on Mount St. Mary’s Monday night at 7 p.m.
Posted in New Britain Herald, CCSU on Saturday, 17 February 2018 20:31. Updated: Saturday, 17 February 2018 20:33.